Jacquie Wohl began fiddling around in the mid 70’s in the Washington, DC area, where she played for square and contra dances and clogging. She was fortunate to have early exposure to the playing of Gus Mead and spent her summers at the Southern festivals listening to Tommy Jarrell, Wilson Douglas, and John Ashby. Jacquie moved to Tucson, AZ in 1979, with husband, Craig, and has been playing regularly for square and contra dances in the Southwest. 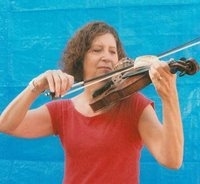 Jacquie has played with the Hambone Sweets in the DC area, the Sandyland String Band and the Privy Tippers. Dave Firestine plays mandolin with a driving rhythm that makes feet start tapping at concerts, dances, and sessions. He is loved far and wide for his tireless desire to play music and his open, all-inclusive jam session leadership style. Dave is a knowledgeable and patient music teacher who has conducted numerous festival workshops with a focus on FUNdamentals. He is a viable part of three bands: The Privy Tippers, Puca, and New Potatoes. Dave is also featured on seven CD recordings and is a featured performer playing Irish music in the Swiss-German film, The Last Blast. Jerry Ray Weinert has been playing the same bass fiddle for over 40 years. Jerry Ray and his bass have lived through the folk scare of the 1960’s, concert & festival stages throughout the US, Canada, and Europe, mud covered fiddler’s conventions in the South, and dance halls throughout the West. He is fortunate to have played with some really fun and rhythmic bands such as The Hotmud Family, The Red Hots, For Old Times’ Sake, and now the Privy Tippers. Given Harrison plays a variety of instruments including guitar, mandolin, and upright bass. He began playing music over fifty years ago when his older brother, Dean, taught him to play a few chords on his new guitar. Given continued playing music and through the years has played in many bluegrass bands including Late For Supper, The Unstrung Heroes, Superstrings, Box Canyon, Highway 76, The Tail Draggers, and Old Town Road. His interest broadened to old time music about ten years ago after attending contra dance events with his wife, Chris, and he began playing in a variety of contra dance bands including Haywire, Running with Scissors, Jump Fingers, Graybeard, and currently, The Remnants. Given is happy to have the opportunity to wear some funny hats while playing west coast events with his long time contra dance band heroes, The Privy Tippers! Jesse Jacob Anderson brings a dynamic and powerful approach to rhythm guitar playing that can help propel dancers and musicians alike into that rare state of contra bliss. 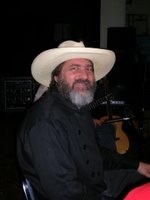 He has played with a variety of groups since moving to Arizona in 1998, including The Frayed Knots, Pick 'n Holler, Updraft, Just Desserts, The Frisco Mountain Moonlighters, The Backsliders, and The Mars Hillbillies. He is also a talented solo artist, playing professionally on The Grand Canyon Railway since 2004 and performing regularly elsewhere in Arizona and beyond.